Who wrote Holden Caulfield? The truth is, many aspiring young writers have given it a shot, and the infamous literary bad boy Murakami Ryū is not exempt from their numbers. Murakami’s early novels, such as Almost Transparent Blue (限りなく透明に近いブルー) and Coin Locker Babies (コインロッカー・ベイビーズ) are filled with dissatisfied young men violently striving to bring meaning into their lives, so what makes 69 special? For one thing, it might have actually happened. The plot concerns nothing more than the vitally important matter of the protagonist’s budding attraction for the lovely “Lady Jane,” a member of his high school’s prestigious English Drama Club. For a high school student living in the boondocks of Japan, the means at his disposal at first seem to be limited. The year is 1969, however, and anything can happen. Considering Murakami’s well-publicized admission of the autobiographical nature of this work, some of it more than likely did happen. The nature of this work as being well-grounded in reality not only gives it an interesting historical flavor but also exacerbates the outrageousness of the lengths to which the protagonist will go to get laid. Simply put, this book is hilarious. It’s also a fact, however, that in 1969 there was a convenient tendency to describe people who studied for college entrance exams as capitalist lackeys. 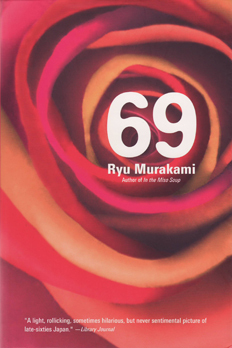 Although 69 seems somewhat juvenile and inane compared to Murakami’s later work, such as In the Miso Soup (インザ・ミソスープ), I feel that it’s almost required reading for anyone interested the background behind the insane and disturbing world of Murakami Ryū. Ah, I’m planning on buying this soon. I love Murakami Ryu’s works. Speaking of which, do you happen to know of a well-compiled list of those available in English? Very interesting blog, by the way. Will definitely be back for more reviews and essays. Thank you for your kind words, and I hope you enjoy the book! I’m not aware of any lists of all of his translated works, but you might want to try searching the Japan Foundation translation database, as well as the Japanese Literature in English database. Also, just in case you haven’t checked, I think the Wikipedia entry for Murakami lists all of his novels available in English and French translation. Thank *you* for the useful hints! Can’t wait to read those I’m missing out on.